As a Milton Keynes web development company, Big Media are not only pretty central geographically in the UK, but are also central in the emerging mobile-friendly web market. 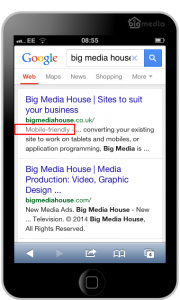 This image shows the “mobile-friendly” label that Google returns alongside results displayed on mobiles. This is what Google will be building on. 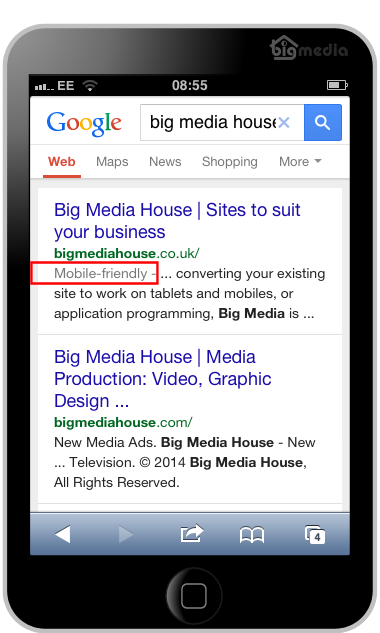 From the 21st April 2015, sites that DON’T qualify as mobile-friendly will drop down the rankings in favour of those that are – this is what we mean by it being ESSENTIAL to have a mobile-friendly site. If your marketing spend is in any way related to driving people to your website, don’t waste it by not catering for mobile users. There aren’t THAT many mobile searches are there? Yep, a BILLION per day, as they account for 30% according to an article on the fastcompany website here. And this article on the Search Engine Land website confirms Google searches are over 1 Trillion a year. Pretty big numbers in our view. This entry was posted in mobile-friendly websites, Responsive web design, SEO and social media on 7th April 2015 by M@Lc.